Many charities and organizations sponsor a “run” for awareness and fund-raising. 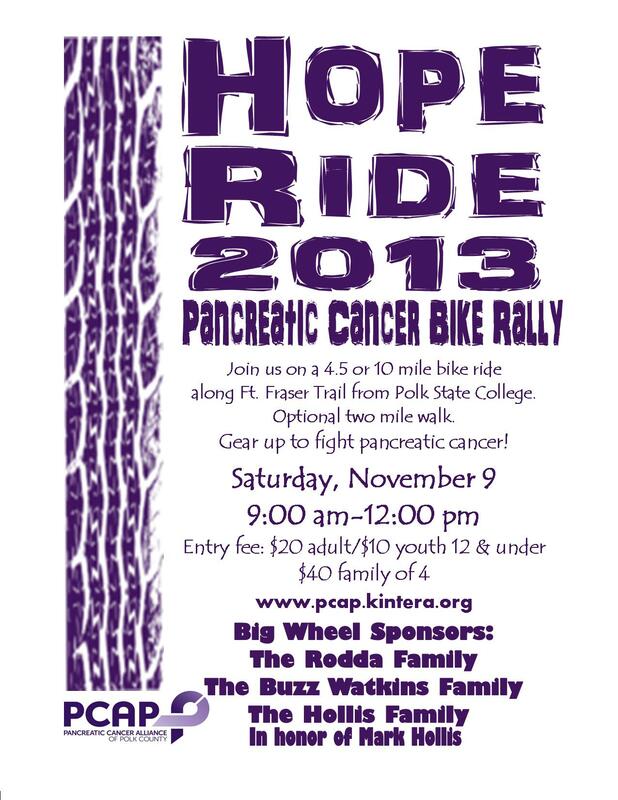 On November 9th, Polk County will be the home of the Hope Ride, a bicycle ride along the Ft. Fraser Trail. 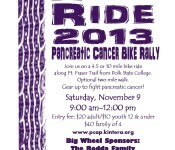 Benefiting the Pancreatic Cancer Alliance of Polk County (PCAP), the ride organizers hope to raise awareness of the fourth leading cause of cancer death. In 2010, after Robyn Ferguson’s husband died from pancreatic cancer, she was informed a close family friend was given the same diagnosis. She was moved to act and contacted several people she knew who had been touched by the disease. “Without hesitation, John Rodda, Cheryl Philpot, Jack Hollis, Victor Troiano and Sam Sheets agreed to join forces to form a coalition against pancreatic cancer.,” she wrote to BikeLakeland. Ferguson add that the community of family members and loved ones make the PCAP a close-knit and steadfast organization, “Symptoms are vague and with no test that allows for early diagnosis, it is often too late when the disease is discovered and there is a lack of viable treatment options at that point. 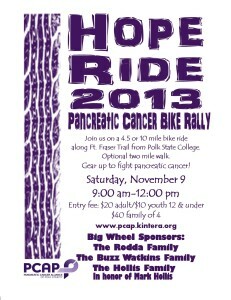 Too many of our friends and loved ones have been lost to this beast of a disease and we want to make a difference. You will not find a more caring or dedicated group of people with a hope and thankfulness for the future than a gathering of people who have been touched by pancreatic cancer at a PCAP event. We have all had to walk the same journey,” she wrote. “We have been striving to make whatever difference we can from that point forward. Unfortunately (because of a pancreatic cancer diagnosis) and fortunately (because they are some extraordinary people) as time has passed more volunteers have joined in with the efforts of Pancreatic Cancer Alliance of Polk County and we hope to grow our presence in the county through our fundraising and memorial events,” Ferguson added. Pancreatic cancer begins in the tissues of your pancreas — an organ in your abdomen that lies horizontally behind the lower part of your stomach. Your pancreas secretes enzymes that aid digestion and hormones that help regulate the metabolism of sugars.